I can’t blame you if you haven’t. Traffic moves pretty fast in this area. Despite the 35 mph sign, it’s not unusually to see some vehicles traveling at 45-50 mph. That’s what happens on a wide-open, four-lane straightaway like this segment of Western Avenue that forms the border of the Dan Ryan Woods near 87th Street. Try driving the speed limit and be prepared for several other motorists to grow frustrated and zip around you. But ever since I saw this sign the first time, I haven’t been able to un-see it. What makes this a good bike route? Unless you have a death wish, I can’t imagine why you would attempt riding your bike around here. But when you think about it, it is, in theory, the best route. It leads right to the woods, it’s a major north-south connector and many of the side streets have been removed from the grid. Also, bicycling is a legally permitted use on city streets, so this is a bike route whether the sign is posted or not. So if this route is so preferred, why can’t we make it safer? This would be a perfect place for protected bike lanes. By narrowing the motor vehicle lanes and installing a separate lane for people on bicycles, an overly wide and dangerous street can become more welcoming to people who use modes of transportation other than cars. That includes pedestrians, as well. This area is near two major bus routes, so even though it’s rare, it’s not unusual to see people on foot around here. Yet to capture this scene, I had to trudge a third of a mile from the Dan Ryan Woods parking lot along sidewalks that probably hadn’t been clear since our pre-snowfall January. No wonder why the other day I saw a pedestrian walking in the street, risking his life among the speeding traffic. 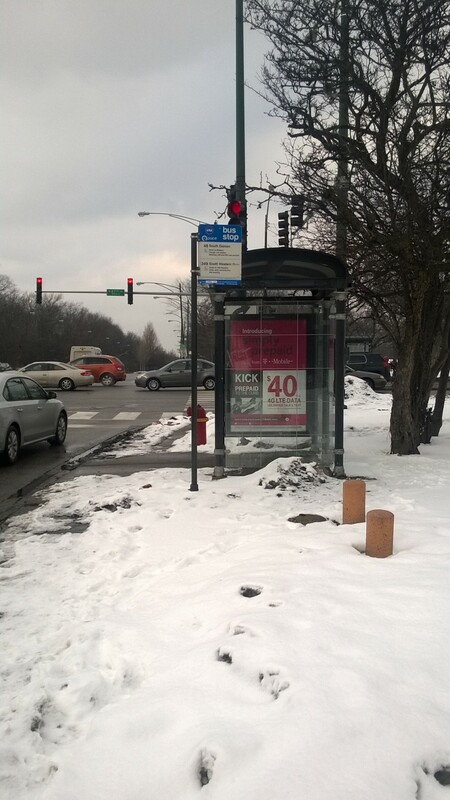 Oh, and if you do manage to make it to the bus stop, be prepared for your unpleasant experience to continue. Would you want to wait here? Are the only people allowed to enjoy the wonders of nature in our forest preserve those who drive? It certainly feels that way, as our perfectly clear road allows for maximum motor vehicle speed — to the detriment of the bicyclists who are evidently welcomed around here — and our icy-snowy-slushy sidewalks force walkers into the raceway. These fixes I describe require minimal investment, but then can improve the livability of the area in a major way by making streets safe for all users and encouraging alternative modes of transportation. And they would make that sign a little less of a head-scratcher. Home(grown) Improvement: Could This Work Here?